One of the main drawback of PPP techniques is their long convergence time. For the standard GPS dual-frequency case, typical convergence to reach centimeter accuracy is about 30 minutes. Ambiguity resolution can speed up the convergence time to some extent. Local atmospheric information can help the convergence as well but requires a dense network of stations close to the rover. The Snapshot PPP concept aims at computing a solution using only one epoch of measurements. To do so, a new technique call OEUFS for Optimal Estimation using Uncombined Four-frequency Signals, was designed in collaboration with NRCan. This technique uses all the signals available, and in particular the E6 Galileo signal, to perform partial or even full multi-constellation and multi-frequency ambiguity resolution. 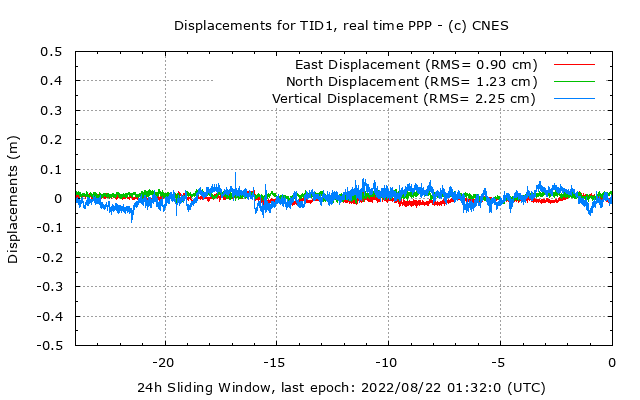 Expected Snapshot PPP horizontal accuracy is between 1 cm and 15 cm globally. Details of the OEUFS method can be found in our GPS World 2018 article (available for download in the links sections). The following figures show the actual results obtained with such a method implemented in the PPP-Wizard demonstrator.